Look at this 3-in-1 multi-task cooking appliance! 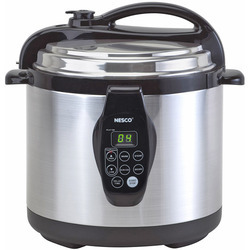 To save time with your meal preparation, use this Nesco 6-Quart Stainless Steel Pressure/ Slow Cooker and Steamer for a variety of cooking methods in one piece of kitchen equipment. Using 1000 watts and programmable settings, this stainless cookware can achieve meals for your family as a crockpot slow cooker, a steamer pot, or an electric pressure cooker. Warm or reheat food for a quick meal or to use leftovers. Create healthy dishes while preserving flavors and nutrients. The easy to clean nonstick inner chamber is a plus. Slow cooks up to 9 1/2 hours. Programmabe digital timer Offers a delay cooking option for up to 8 hours in the slow cooker. Pressure cooker settings Provide a range of pressure to maintain flavors and nutrients in foods. Locking cover for pressure cooking Keeps lid securely in place during cooking time. Safety steam release Insures cover is not opened until interior pressure is reduced to safe limits. Stainless steel cover Adds to attractiveness of this kitchen appliance. 3-in-1 feature Allows for variation in cooking methods while using only one piece of cooking equipment. Warm or reheat foods Using steamer pot or crock pot settings.